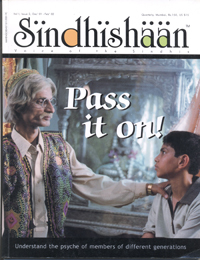 I have received a copy of “Sindhishaan” and going through, I feel it a dream-come true. Please accept my compliments for such a professional publication which was long awaited. Sindhis are scattered all over the world without any state of their own. Although efforts are being put, I feel it is a mirage like thought to come true. The only possibility could be that a township like “Beas” be developed for Sindhis under the guidance of saints like Dada J. P. Vaswani where Sindhis could buy the dwellings and prove their number and strength.